This week at Halesowen I was going to hang around and let someone else suggest games again, but master-organizer Mike split the highly undecisive half of the room I was in up to groups with me providing a game for 4 of us from that group. Mark showed interest in playing Belfort, as I had the box out as a result of picking up Belfort: The Expansion Expansion, so out it came (Without the expansion, mind, I need a chance to learn how it works before I throw it at people, particularly with new players ^^). The players for both games were: Mark, Ian, Stan & Me. Belfort is a worker-placement game where players are vying to me the most influential participant in building up the city of Belfort. The game is played over 7 rounds, and 3 of these, the 3rd/5th & 7th are scoring rounds. When scoring, players get points based on majority participation in the 5 segments of the city, (5/3/1 points awarded to 1st/2nd/3rd place respectively) and then points for most workers of the 3 types – Elves, Dwarves & Gnomes, with 1st place earning 3 points and 2nd place earning 1 point – There’s no 3rd here. The big caveat here being that scoring points also leads to paying taxes, with each 5 points taking you up a tax bracket (Paying 1 more money per round in taxes), this makes it so after the 3rd round players need to start being careful to ensure they have enough money to spare, or lose victory points if they don’t! Each round takes place in a number of phases. The first of these is placement, where players can place their workers on the variance ‘plank’ spaces on the board & their own properties. Available in every game are ‘Recruit a worker for 2 money’ and ‘Switch Player Order’ spaces, the former of which has more spaces available for higher player counts (resulting in 3 players being far tighter for workers than 4/5). There are also 5 ‘guilds’ which have spaces available, which are different every game and provide the big variability in the game. In our game, we had 2 resource guilds (4 Wood, 2 Iron respectively), 2 Basic Guilds (‘Place a coin under a property to make it worth 50% more for majorities’ & ‘Recruit an Elf, Dwarf or Gnome’) and 1 Interactive Guild (Gain 1 Coin + Receive 1 resource from each player with less walls than you). The rulebook has suggestions for the distribution of basic/interactive/resource but I just go with 2B/2R/1I as it’s fairly easy to pick up for new players. It should be noted that you don’t immediately get the benefits when you place a worker, that comes later. When a player passes out of the placement phase, they distribute their remaining workers (And there will be some) across 4 resource gathering spaces. These spaces provide wood (But requires Elves only), stone (Requires Dwarves only), iron (Requires an elf + dwarf) or coins (Either). These give you a straight 1:1 of number of workers to resources, but whoever has the most workers (Ties don’t count) gets one bonus resource, so it can be worth it to stagger your needs so you can take majorities and get those additional resources. (Also, this is one of the elements of the game which benefits you to be last, as it’s easier to work out where you can nab/block a bonus from other players). Once everyone has passed and distributed their workers to the collection area, placement is over and the collection phase begins. Players take their workers back from the collection area and take the resources they’re due (Including bonus if they had the majority), as well as taking an extra worker if they invested in one (Not from the guild as that’s on the city board) and order-rearrangement. At the end of this phase, players receive income and pay taxes. Income is from properties, and some of those that you can build have a coin icon in the top corner. Taxes are, as I mentioned earlier, based on your score, so if you scored high early, you’d best be sure you can afford to pay for it now! Following this comes the action phase. Going in (potentially different to placement as it changes in collection) player order. In this phase a player can build properties, walls or guilds (Spend resources & place one of your house pieces in the city to represent it’s yours), visit the trading post (Buy 1 thing and sell 1 thing), retrieve workers (Getting their benefit at this time) and buy a gnome (one/round) for 3 coins. These can all be done in any order, then at the end of their turn can buy 1 property card (3 are face up, or can take a random) for 1 coin if desired. Being 1st in this phase helps you avoid interactive ‘steal resources’ abilities by running yourself dry, but being last means you’re building properties last and have an easier time getting majorities in the various sectors in the city. When teaching the game I suspect I placed too much emphasis on early scoring making things difficult for the players. I say this because the first thing everyone did (Including me, to be fair) was place 2 properties in an area away from other players. Ian was the first (I think) to spread out a little. As a result of the ‘gain a worker’ guild I went for a focus on rushing for a lot of workers in this game over getting buildings. The first round of scoring put Ian out into the lead with his wider spread of property placements, me & Stan in the middle of the pack, and Mark at the back who very much avoided getting early taxes. (I think it was something like 3/turn for Ian, 2/turn for Me/Stan & 1 for Mark). As the game moved forward, I continued to spam workers and tried to keep the space blocked so that noone could contend me for those points, while also taking the space that improved my properties to be worth more for majority as I wasn’t able to build as many. Mark set himself up with a wall to take resources from players so I made sure to build a couple of walls to keep myself protected (As well as get majorities), the side-effect of this is my stack of workers usually just went to gather money so I could pay my tax (Most properties provide income, walls don’t). Ian managed to get out a lot of properties and spread them around (Not many more, but I think he had the most). I think Stan was focused on propeties too, but he was being a little quieter so I’m afraid I missed a lot of what he was going for (Sorry!). As we moved into the last season (So just after the 2nd scoring phase where our taxes get really quite high) Ian maintained his lead, while I stayed fairly close behind and Mark managed to capitalize on his lower taxes before to build enough for a big jump to catch up with the pack. I got a bit worried through this bit as the territories I was in got quite highly contested, but the extra strength of my buildings from getting that guild every turn in the game helped me keep up enough to do ok. I’m not sure who of Mark/Ian & Stan got the most points from area majorities in the last round, but I believe Ian/Mark got ahead of me until we counted up worker majorities, where my 6elves/6dwarves (Or 7, not sure) net me 3 points each and caught me up to Ian for a tie in first place. Strictly I won from having more resources left over (I tried to gamble with the thieving guild but just got tons of wood when I needed but 1 stone!) but I decided to share the key-to-the-city, for now! Mark was close behind and Stan wasn’t much behind him either (I think that’s the right order anyhow). Following Belfort, we had roughly an hour left so I suggested Smash Up and some interest was shown so I grabbed the box to play. I have some ‘selector’ cards which me & my girlfriend made to make setup a little more random with a draft for each players 2 factions (As the standard rule tends to result in the same faction combo’s every single game). This left me as Alien Locals, Stan as Robotic Bears, Ian as Elder Carnivourous Plants & Mark as Steampunk Cultists. If you’re not familiar with the game, the reason we each had 2 factions are because we take those 2 decks and shuffle them together to play, hence the slightly random sounding pairs! Each deck has a number of minions/actions (Usually 10 of each) and those are played throughout the game to try and capture ‘bases’. Each base has a breakpoint, an effect and some scores. When the power of all minions on the base is over the breakpoint, the scores are distributed to players depending on how much power they had there. The effects vary, and could be when minions are played, when it scores, etc. Each turn, players can play 1 minion and 1 action, which may allow them to do further and more interesting effects based on what the card says. The start of the game set the precent, with Marks cultists stacking him with madness & Ian doling out even more besides with a byakhee on a base we shared. We shared that base because Stan moved one of my minions there of course (And that particular base soon became ridiculous, with 5+ actions on it and a ton of minions, which took ages to capture as the plants overgrowth card nerfs everyone elses minions by 1 power). Mark made the understandable mistake (First time with cthulhu) of using a fair few madness cards to draw cards rather than returning them to the deck, I generally flailed a bit as my minions/actions just wouldn’t synergise and Stan/Ian did pretty well through the first half of the game. Sometimes that can change, but on this case it was actually a pretty consistent in that Ian & Stan continued to do well at grabbing bases. Most of Ians madness cards came to me & mark thanks to neat choices made by Stan, particularly in where he placed and where he moved minions to (I.e. making it less attractive for Ian to use a Byakhee on bases he was on so he got less madness from it). I continued to struggle, and while I got a base to 10 power without anyone else bothering to compete for it couldn’t quite capture (I had an action that would have made it 15 but didn’t seem to be able to get enough power there until nearly the end of the game for it actually work). A base came out at one point that could have removed all of Marks madness and catapulted him to compete with Ian, but as I had a terraform card I used it to prevent this and hoped it might delay the game long enough for me to start scoring points (Which it turns out was fated not to be). We started running out of time near the end of the game, and reduced the playspace to make things go faster (When the last few bases scored we didn’t replace them). I managed to get the base I was going for on my own I think to take 3 points, as well as contributing to another, but this only got me to 9 points for the end. Ian got his ‘2 madness cards to every player’ card right near the end which made it extra difficult for us all as we had to waste actions getting rid of it, and Stan, while he did quite well, didn’t quite get enough points down to take the lead off of him. At the end of the game I think Stan had 1/2 madness, I had 4 (Reducing me to 5 points, waaaah), and Mark had well, lots, but had a lot more points than me and finished on I think 7. Ian took the victory here, so congratulations to Ian ^^. That’s all for now, although I’m probably going to make a post soon about a couple of kickstarter projects if anyones interested in crowdfunding some stuff (Tuscany & MERCS: Recon). If anyone who goes to halesowen each week is interested in Tuscany I can set up a game next week with prototype bits ^^. Cheers! 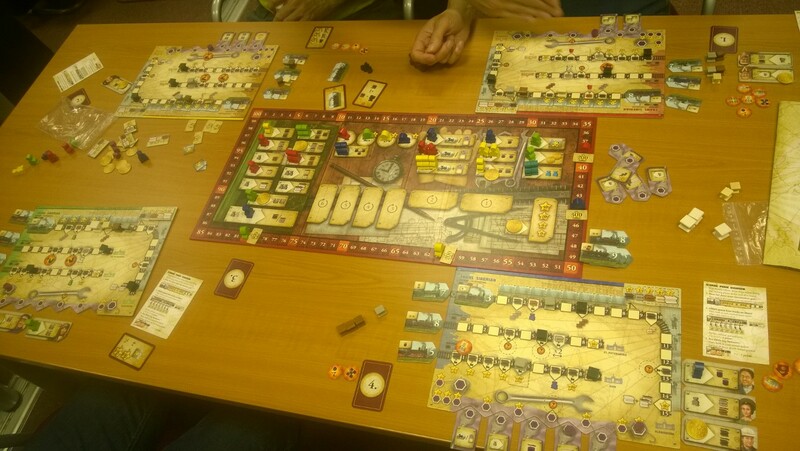 This entry was posted in Board Games and tagged Belfort, Board Games, Games, Halesowen, Kickstarter, Smash Up, Tabletop on March 14, 2014 by Smoothsmith. Explanation for this one took a little while, as there’s a lot to the game with a ton of spaces to go, bonuses to earn, tracks to follow, etc. Each player in the game has a personal player board with 3 train tracks and an industry track, with players being likely to focus on 2 of these 4 things (Probably a 3rd too, but unlikely to finish it). The first track is a long one, reaching from Moskow to Vladivostok, and is where the biggest focus will be if you want to score by building railway, as it has a number of spots for ‘x2’ tiles which double the values of track in those places. The second track goes from Moskow to St Petersburg, and has good options for picking up bonuses (Of which there are 7 unique ones available) as well as a x2 multiplier for the whole line (But it doesn’t support the best quality rails). The 3rd track runs Moscow to Kiev, and scores points for having black track down (Which is normally 0), or a higher-than-average score for grey by taking a bonus that could net you 20 points/turn. The last track isn’t for rails, and instead traces your industry. Moving this track forwards gives you straight bonuses for victory points, as well as triggering factories which you can place along the way (Which also let you jump over gaps in the track). The big caveat is that you don’t automatically score for advancing this tracks! Throughout the game you need to obtain trains and factories which you’ll place by your board to be able to advance the tracks and capitalize on them. For the rails, this means putting a train to the left of the track (Or 2 for the big line), which then lets you score up to a certain number of spaces along the line. For industry it lets you get over gaps while also proving unique bonuses for when the industry marker(s) pass over them. These 2 things get better throughout the game, but are extremely tight! There are only 3 spaces on the board to get trains or factories, and 4 people to compete over them! The next big thing about the rails, is that there are various qualities of rail to build. At the start of the game, you have only black tracks, which are worth 0 points a piece and are mainly for unlocking extra stuff (Like the other track types!) as you advance them along the line. You will then get Grey, Brown, Blank and White tracks which are worth more points respectively. The higher quality tracks are build over previous ones, and can’t go ahead, so you must advance the black track along if you want to advance the grey, and the grey along if you want to advance the brown etc, hence making the higher quality rails very difficult to advance particularly far from their starting point. The game is played over 7 rounds (Less in a 2 player game) with each round being tracked by how many engineers are remaining. The engineers are an ‘available once-per-round’ resource that provide a unique action space for their owner, with the upcoming engineers being available to everyone for a short amount of time. Each round, one player only will get to obtain the latest available engineer, making them a scarce commodity. They cost money however, and money is extremely scarce in russian railroads with only a single space to gain it, that only provides 2 at a time. Money does have an advantage that it can be played as if it was a worker, as well as to a few unique spots which require it (So many rounds the first placement is that saught after take 2 money space). In addition, the player with the most engineers at the end of the game gets a nice bonus of 40 points, and the player with 2nd most gets 20 (Ties are broken by a number on each engineer), so sometimes it can be good to grab one even if it’s not particularly useful to you. At the end of each round is a scoring phase, which is based on your rails and industry so far. As a result the scoring has a cumulative effect so you score more each round than the last (Which has a great feel-good feeling of advancing your setup). *Breathes* So that’s roughly how the game goes, with spaces on the board being to advance rails, industry, take 2 money, take 2 temp-workers or take the engineer. Some spaces take more than 1 worker with players starting on 5 and potentially getting up to 7 later in the game. Things are tight, and only one can succeed! At the start of our game, I made a decision to go for industry, as I presumed (Correctly it would seem) that the other players would compete over advancing and scoring through their railroads. I started in last place and stayed there a couple of rounds where I could still pick up what I wanted thanks to the reduced competition for it. Early on this worked well and I had the lead for the first half of the game thanks to industry points happening early on. Mike seemed to focus on advancing his main rail while picking up some industry on the side to gain x2 multipliers through factories he’d picked up. Gordon went very all-rounder, advancing all tracks (Partly for the extra workers) throughout the game, as well as going for industry. Scott focused completely on his rails, with the majority of his focus being on the main track and getting the maximum rail quality onto it. A couple of years in I decided I wanted to go for an upcoming engineer as it had a space for 2 industry with one worker, which for me and me focus on industry looked like a perfect match. I took first place and grabbed the engineer, planning to pretty much ignore the rest. Subsequently however I managed to get the 2 money space and double it up using my first factory, so I had lots of money which I decided to use for another engineer, (In the end I got 3). Mike struggled to get money and I think the first time he went first he took a different action (Not sure which), which seems to be a risky plan in this game as the money is just so important. Around the middle of the game Scott managed to get his rails to blank which with his x2 multipliers up the start of the track really got worrying. Mike had a lot of x2’s down but just didn’t quite have a high enough quality of track on it to do so well, and Gordon was in a similar situation. As we came into the last couple of years, Scott had leaped out ahead of me with his x2 increased value tracks (One of the ? bonuses is to increase the value of the better rails). It was hard to appreciate a focus on rails until that point where it got suddenly very scary ^^. I managed to catch up a little after a factory got discarded that gave points for your engineers (Of which I had 3 thanks to the money boost), I made use of activating bonuses through the st-petersburg line to get a second industry token and run it past my factories a second time, giving me some bonuses I didn’t expect and getting me the nice engineer bonus a second time. Gordon managed to finish his 2 shorter rails off getting some nice bonus points while Mike got his main rail to a point it could score well, but a little too late (The lower quality tracks were advanced very far, which I’m not sure is worth it, not for the grey rails at least). Scott got a ridiculous amount of points in these last couple of rounds, with 5 maximum quality rails doubled in value to 20 a piece, 100 points just from those 5 tracks! (Vs my 45 from industry, which would have maxed at 55 leaving me to rely on other sources for the extra points). This entry was posted in Board Games on March 6, 2014 by Smoothsmith.